Thought I should try out the first hero in the Advanced Pack before the second one drops. So started out on Nightcrawler. He looks like a fun character, with his teleportation powers, and he seems to be very visually extravagant. He's also a fun sight to watch when others are playing him. So I have been playing quite a bit already. He's currently at Level 18 so I have got access to quite a few powers already. Took a quick look at his power trees and I decided to stick to just 2 trees; Cunning Acrobat & Rapid Teleporter. I might consider investing in 1 or 2 powers in the Expert Swordsman tree though, probably a basic attack or Flying Sabre, which looks very interesting. Not too sure on how the Stances work, so will have to wait till I'm level 32 to unlock those. Are they like passive auras where you need to activate them or powers? His damage looks to be very good but it's against high damage bosses, that he seems to suffer quite a bit. His shadowmeld and teleport power is quite useful in keeping alive but he can go down pretty quick if I'm not quick enough. Kinda got stuck at Pyro at Command Bunker now, so I'm farming at Midtown Mayhem till he gains a couple of levels. Pyro is appearing 'orange' now so I might have been rushing through the story mode a bit too fast. I might need to boost his defense a bit in later levels to survive. 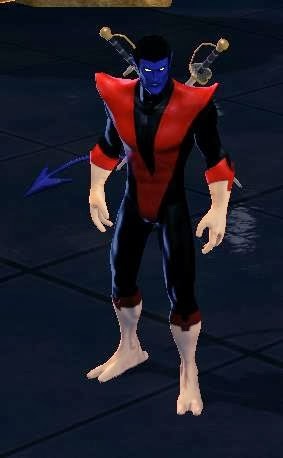 However, if his spirit levels get decent later on in the game, I can see him taking enemies down before I even have to worry about them doing damage to Nightcrawler. Will focus on levelling him to Level 25, at the very least, for his synergy boost before I try Moon Knight which has already dropped as I'm typing this post. Just waiting for the server to be online again. 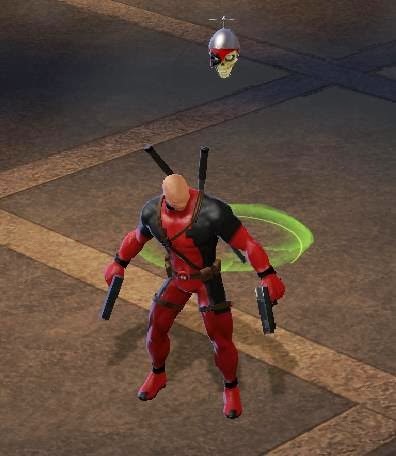 Also I bought the Headpool pet with the Gs I was saving for Lady Deadpool.. It was the one pet that I was longing for as I missed it when they had it for purchase during Halloween last year. I was just wondering the other day, if this would ever come back up for sale and surprise, surprise, it's back in the store. Not going to miss the chance again, so I grabbed it. He's an Enhanced pet so he has his own voice-over so it's really crazy with the 2 of them yapping away. Now to level him back up so he can use his Daddy Deadpool Device and I can take a family pic with the Baby Deadpool as well!